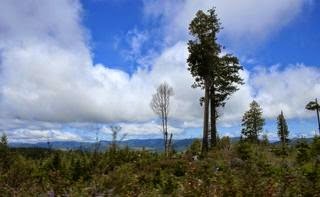 THPBlog: Green Diamond Resource Company to clearcut log near Blue Lake, CA. Green Diamond Resource Company to clearcut log near Blue Lake, CA. This THP is about 10 miles east of Arcata, CA and about 4 miles SE of Highway 299 and the town of Blue Lake at an elevation of 1,450 to 2,850 feet. Green Diamond Resource Company is planning a mostly clearcut feller buncher, shovel and cable logging operation on steep and unstable slopes in Douglas fir and redwood forests. The THP area flows into the Mad River which is listed as impaired for sediment, temperature and turbidity. There are 7 shallow rapid landslide features located near class II watercourse areas in unit A, 4 shallow rapid landslide features located near class II watercourse areas in unit B, and multiple shallow rapid landslide features located near class II watercourse areas in units units E and F. There are also multiple road failure sites including fill failures, sinkholes, washed out crossings and diverted drainage channels within the THP area. 19 road drainage sites are planned for work including rocking, dip construction, culvert repair/replacement and road bed stabilization. Green Diamond Resource Company wants to use a skid trail inside a class II watercourse in unit A. There are spotted owl sites within .25 mi of units C,D and E, and within .5 mi of units B and F. More information is available on the THP Tracking Center website.